Drink Carrot Juice without juicing! Just Carrots comes as freeze-dried crystals or tablets. The crystals are concentrated 25 times, which means that 25 pounds of raw carrots are used to make one pound of Just Carrots crystals. The caplets are formed from the crystals. Just Carrots is 100 percent natural carrot juice crystals or caplets with only the fiber removed. Just Carrots has one of the highest sources of natural beta caroteneup to 360* percent of the Recommended Daily Allowance (RDA). Drinking one glass of Just Carrots provides you with 18,000 to 20,000* IUs of beta carotene. In addition to beta carotene, Just Carrots contains vitamin C, calcium and potassium. Just Carrots is monitored for maximum nutrient levels. A single serving of Just Carrots crystals contains 40* calories; a single serving of caplets contains 25* calories. When you eat raw carrots, only 1 percent of the beta carotene is absorbed by the body. Cooking breaks down the fibrous walls of carrots and increases the bodys absorption to 19 percent. Approximately 90 percent of the beta carotene in Just Carrots is absorbed. The carrots used in Just Carrots are residue-free, ensuring that you will not be getting harmful toxins. A special process is used to produce Just Carrots, which ensures that nutrients and enzymes remain active. This process does not use additives, sweeteners, fillers, or artificial ingredients to produce Just Carrots. The caplets contain a small amount of inert binders to hold them together. * These figures vary depending on variations in carrot crops due to climate, soil, and times of harvest. Take 1 tbsp (12 g) 1 to 2 times a day. Mix with water, juice, or other members of the Garden Trio ® (BarleyLife and Redibeets). For best results, place Just Carrots dry under the tongue. Drink Just Carrots immediately after mixing it. Just Carrots is best taken on an empty stomach: 30 minutes before or 2 hours after a meal. You may use more or less depending on your or a health practitioners assessment of your nutritional needs. Shelf life is 2 to 3 years, unopened. Store in a cool, dry place (70 - 75 F; 20.1 - 23.8 C). Do not refrigerate. 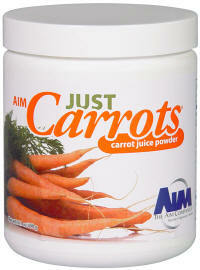 You may mix Just Carrots with other AIM products, except Herbal Fiberblend. Take Herbal Fiberblend 1 hour before or 30 minutes after taking Just Carrots crystals. *The above figures are an average; specific figures vary from batch to batch due to variations in crops due to climate, soil, and times of harvest. Blauer, Stephen. The Juicing Book. Garden City Park, NY: Avery Publishing Group. 1989. Passwater, Richard A., Ph.D. Beta-Carotene. New Canaan, CT: Keats Publishing, Inc. 1984. Passwater, Richard A., Ph.D. Beta-Carotene and Other Carotenoids. New Canaan, CT: Keats Publishing, Inc. 1996. Walker, N.W., D.Sc. Fresh Vegetable and Fruit Juices. Prescott, AZ: Norwalk Press. 1970. See BarleyLife  or RediBeets for more information on these great juice products.